“Go West, young man, go West!” That was the famous advice given to a whole generation of young Americans by the New York newspaper editor Horace Greeley. For anyone getting into the advertising business today, the new buzzword is "Channel Planning." Learning about Channel Planning means the start of a bright career at this moment. Is this something new and exciting? Not, really. It is just stating what has been obvious for the longest time, except now is the time to actually do the obvious. Historically, the application area was known as Media Planning. Here, the advertisers decided where they would allocate their marketing budgets into promotions, advertising, etc. Then they would ask their specialist agencies to implement those campaigns. Thus creative advertising agencies would design the appropriate creative advertisements and the media planning agencies would place them into the media. Very often, the advertising agencies would simply put a huge chunk of the budget into the largest media (television, radio, magazines, print) in what they claimed to be optimal allocations within the given budget. But everybody knows that consumers derive their opinions about product brands and formulate their intent to purchase from a number of sources, including but not exclusively limited to the major media (television, radio, magazines, print). There are any number of other communication channels (such as websites, email, direct mail, telemarketing, in-store advertising and promotions, event sponsorship, product samples and even word-of-mouth). It used to be less compelling to want to change the modus operandi for a couple of reasons. The major media (television, radio and print) were dominant. But this is no longer the case today, as other communication channels are flourishing. There was also not much information known about these other communication channels, but this is no longer true today. There are quite a number of databases that collect the information required for channel planning. As this is a complicated planning process involving multiple channels, attributes and effectiveness factors, all the major media planning agencies are rushing out to set up specialist divisions or even separate companies to conduct channel planning. In this sense, channel planning will be the most rapid growth sector within the advertising industry. Anyone can join at the entry level and will probably be rapidly promoted during the era of rapid expansion. In the following, we will illustrate some of the basic premises of channel planning. We will use the Compose database compiled by MARS. This is a survey of 2,249 adults in the United States who were surveyed by mail during late 2005. 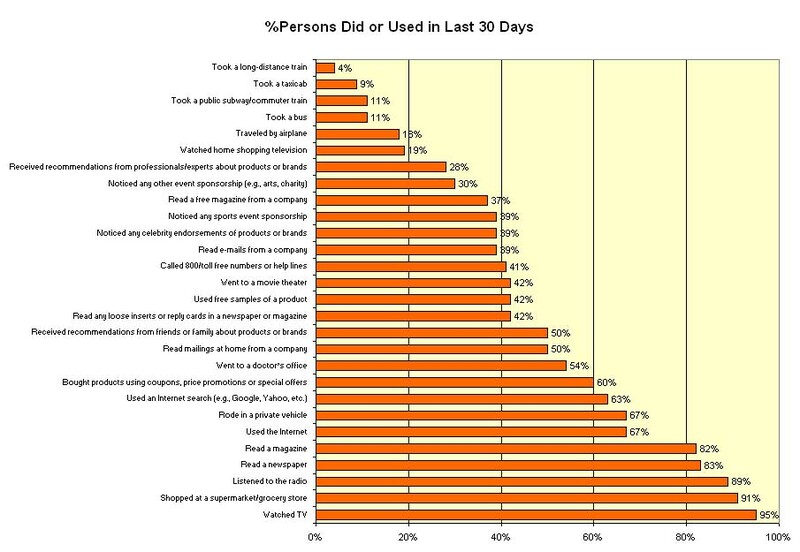 For starters, we will show the usage for some of the communication channels in the Compose study. Why do we care about a long-distance train? Because this is an opportunity for certain types of communication message while the consumer is stuck in a closed environment without access to many of the other communication channels. The traditional major media (television, radio, newspaper and magazine) dominate usage. It is for this reason that these media have dominated traditional media planning. While shopping at a supermarket/grocery store is a popular activity, communication planning has been traditionally relegated to separate promotional specialists rather than media planning agencies. Next, we show some obvious facts. The overall idea is that not all products are alike. 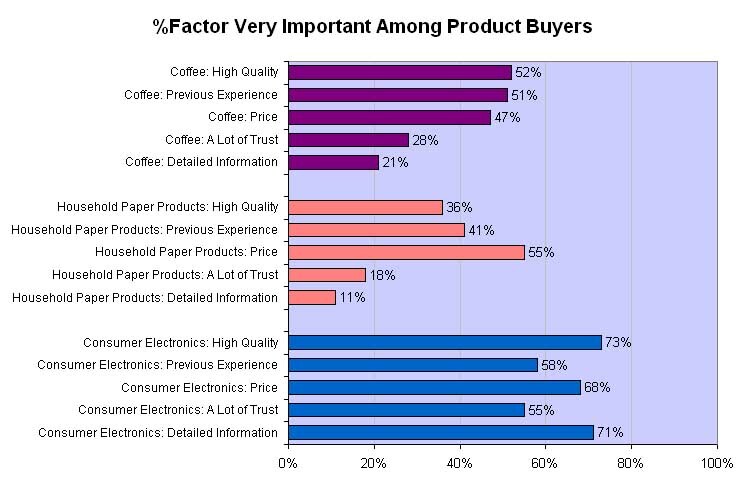 The table below shows the percentage of product buyers who regard a list of factors or attributes as being "very important" in their purchase decisions. When it comes to coffee, it is the price, quality and previous experience and not many people care too much about the details of what is inside their coffee. When it comes to household paper products, it is the price that drives the purchase decision above all; a lot of consumers probably have several brands that they consider interchangeable and will look for the cheapest one on any shopping excursion. When it comes to consumer electronics (such as mp3 players, television sets, etc), the consumers need to have plenty of detailed product information plus good quality and price. Historically, the information about the purchase drivers for the products are incorporated in the creative portion of the communication message. That is, for household paper products, the 30-second television commercial or the newspaper advertisement may focus on price issues. By contrast, the magazine ad for a personal computer will contain a lot of detailed product specifications information with price information and quality assurances. But the full equation should have considered that not only do products have purchase drivers, the communication channels themselves have certain traits that are advantageous or disadvantageous for certain types of communication messages. If you want to provide the detailed specifications of a personal computer, a thirty-second television commercial will not do this for you. If you are Coca Cola and you want to highlight the special prices across your entire product line, then a radio ad will not do the trick. The important thing really is to be able to match the communication objectives with those communication channels that can optimize effectiveness. 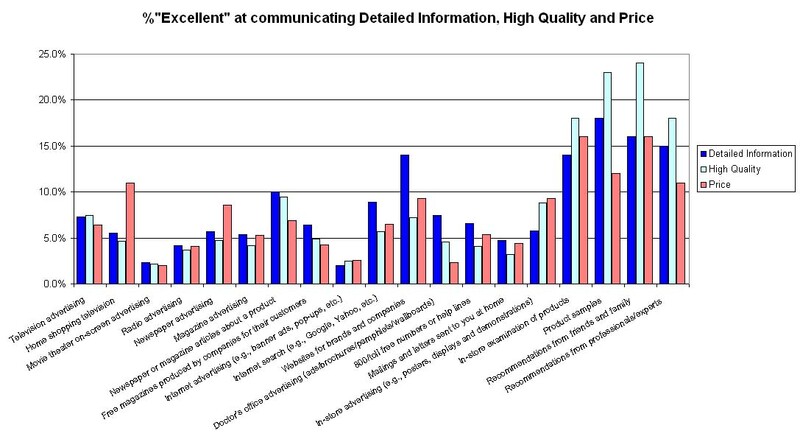 The following chart shows how a selected list of communication channels can communicate detailed information, high quality and price excellently to consumers. Relatively speaking, television may be the biggest medium but its communicative attributes are not outstanding. For example, if you want detailed information and quality, television is bested by newspaper/magazine articles, Internet searches, company websites, in-store examinations, product samples and personal recommendations. If you want some price information, television is bested by home-shopping channels, newspaper advertising, company websites, in-store advertising, in-store examinations, product samples and personal recommendations. The opening in the field of channel planning is that the problem is complex (product purchase drivers, channel traits, consumer psychology, sequencing, etc). In this new frontier, the channel planning groups are coming up with their own solutions which they propose as unique, brilliant and beneficial to their clients. In these pioneer days, it is premature to say which approach is working or not, and a great deal depends on bravado, self-confidence and presentation. That is why there is so much excitement.